HOMESTEAD, Fla.— “I bet no one here knows how the islands of the Keys were created,” Biscayne National Park Ranger Denise Ratajczak said as she was giving a jetty walk tour to a group of visitors. “Some may not believe me, but those islands and almost every other kind of land was created with the help of mangroves,” she added. Biscayne National Park is 270.3 square miles in size, 95 percent of this area consisting of water. Mangroves surround and are within both the land and bay, creating habitat and protection for different kinds of fish and birds that reside within and around Biscayne National Park. Click on the video at left to see an audio slideshow prepared by writer Andrea Fernandez-Bravo about ranger-led tours at Biscayne National Park. The majority of people, whether South Florida residents or tourists, tend to overlook mangroves and the importance that they have for the ecosystem. Locals take them for granted and really just gaze past them as they try to look at the ocean (or bay). Or, if one is on a boat, the person looks past the beautiful greenery and interesting roots of mangroves and notices the land. Tourists tend to look at mangroves for a split second, and then their attention is diverted to either an animal they see or to the ocean. However, if people really knew how important mangroves are to the creation of coastlines and even the creation of the barrier islands between Miami Beach and Key West, people would be genuinely interested in these special plants and what they do. 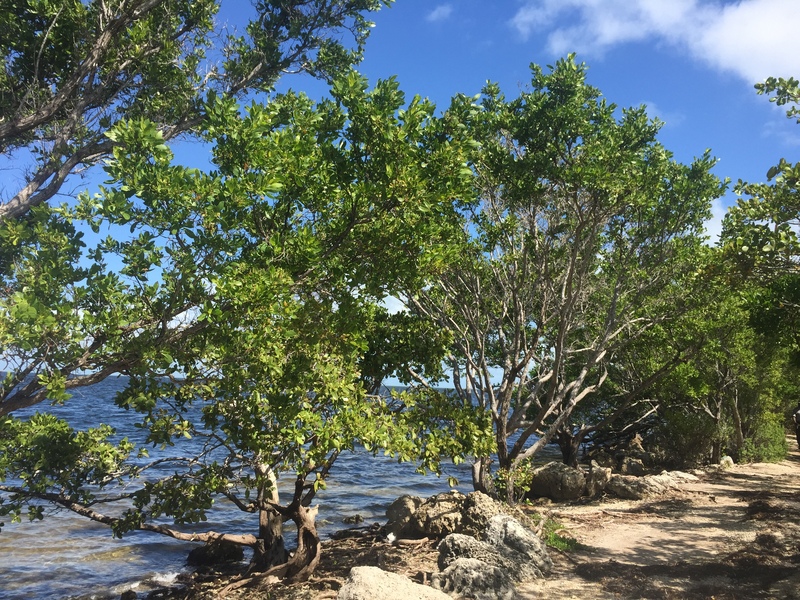 Taking jetty walking tours and learning from different exhibitions and programs, interpretive rangers at Biscayne National Park explain to park visitors about the importance of these green, lush plants. 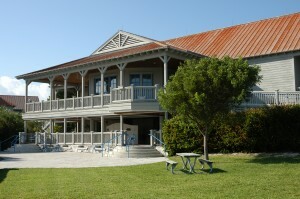 The Dante Fascell Visitor Center at Biscayne National Park (Staff photo). Park visitors will mostly learn about the salt-tolerant mangroves that live within the park if they take a ranger-guided tour or program. They will learn that, within the park and in the rest of the world, there exist three different kinds of mangroves: white, black, and red mangrove. Along the main trail of the park, which is just a half mile in length, park visitors who are taking a tour with a park ranger will have the chance of seeing, touching, and learning about all three types of mangroves. Before going into the specifics of the three types, park visitors will learn how all three mangroves contribute to society and land as a whole. First of all, mangroves created Florida’s coast. Islands such as the Keys and the Bahamas wouldn’t exist if it weren’t for mangroves creating the land and protecting shoreline erosion. Mangroves also protect land from flooding and protect juvenile fish, crustaceans, reptiles and birds from prey. Mangroves also are phenomenal areas for these animals to breed. Even though they do so much for the ecosystem and animals, to further demonstrate how versatile mangroves are, when they want to reproduce, the plant drops a seed pod (known as a propagule) that can either land in the bay or on land. The seeds take root when they drop onto land, but if they drop into saltwater, they seed can float for up to a year and take root once it finds soil. A white mangrove rests between the bay and the edge of shore (Photo by Andrea Fernandez-Bravo). The first and smallest type of mangrove visitors will see on a tour is the white mangrove. One will know that he or she is looking at a white mangrove because these are the ones that most people see, especially in Biscayne National Park where they dominate most of the land. These type of plants only grow in areas like Biscayne National Park’s bay and similar areas such as lagoons. White mangroves grow further upland than on the ocean or bay and they do not have distinctive roots such as the red and black mangrove. Instead, they look more shrub-like, as they grow wide and have oval-shaped green-yellow leaves that are sometimes surrounded by very small beans (propagules). The next mangrove that park visitors will see and learn about while walking on the trail is the red mangrove. These roots create a safe habitat for juvenile fish and other animals as mentioned earlier, but in Florida, the almost too-hot temperatures limit the red mangrove’s habitat. Because of this, the red mangrove only reaches around 20 feet in height as compared to the almost 80 feet when the plant is in favorable weather conditions. They grow at sea level along the shoreline, helping trap sediments and build up land when the tide comes in. Along with the dark green, waxy textured leaves, their seeds (propagules) are interesting because they are long and cigar-shaped. Red mangroves also blossom exquisite small, fuzzy-looking white and yellow flowers in clusters at the end of the branch. 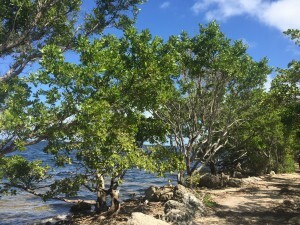 As park visitors walk along Biscayne National Park’s jetty trail, they will see branch-like roots coming out of some areas in the dirt that surround the trail. Just like white mangroves, black mangroves grow further inland due to the needed wet soil. They produce small round seeds and have egg-shaped green, sometimes light green leaves that have small hairs in the bottom of the leaf. The small round seeds (propagules) are found at the end of the branch, and eventually, the seeds open up into delicate-looking flowers that blossom during the spring and summer. All three mangroves keep the park’s water clean and the leaves can be provided as food for certain aquatic species that eventually feed larger aquatic species such as lobster and shrimp. With enormous areas of mangroves within and around the park, it is easy to see why Biscayne National Park’s programs and jetty walk tours teach park visitors so much about these three distinct mangroves and what they do as a whole for both animals and land. Dante Fascell Visitor Center Address: 9700 SW 328 St., Homestead, Fla. 33033. Visitor Center hours: 7 a.m. to 5 p.m. during the season. Take I-95 to Florida state route 836 West. Keep left at the fork and continue onto exit 826 South and merge onto Florida state route 826 South and continue to keep left until you reach Florida state route 874 South where you will see Homestead signs. From here, merge onto Ronald Reagan Turnpike and take exit 6 for SW 137th Avenue toward Speedway Boulevard. Follow SW 137th Avenue and SW 328th Street until you reach the Fascell Visitor Center, which will be on your left. Jetty walking tours are free. Kayaks and other equipment are not for rent until December. Pricing currently unavailable.